Six spellers, one dream… TO WIN the Putnam County Spelling Bee. Join the TCDS for a musical experience of 6 young children entered into a spelling bee, presided over by a neurotic vice principle and past winner. Moving in and out of reality, the audience is taken on a journey of hysterical self discovery of each participant. Each performance promises to be unique, featuring audience volunteer spellers, improv and who knows, maybe divine intervention as well. Join us for a musical experience you will NOT forget. The Third Story, written in 2008 by American playwright and actor Charles Busch, is equal parts surreal comedy, family drama, and film pastiche. In the 1940’s, in a quaint Nebraskan home, hardboiled and out of luck screenwriter Peg tries to convince her burnout son Drew to collaborate on one last screenplay. At the same time, the film in their imagination unfolds before us. Part film noir and part sci-fi schlock, the story eventually becomes a genre-confused romp with gangsters, zombies, clones, and the kitchen sink. All the while, we become privy to a third story; the Russian fairly tale that Peg would tell Drew as a child. As the other stories development, this tale of a shy princess and vulnerable witch becomes more and more familiar. Inspired by the story, and by their own lives, Peg and Drew try their best to finish the movie and to mend their fractured relationship. 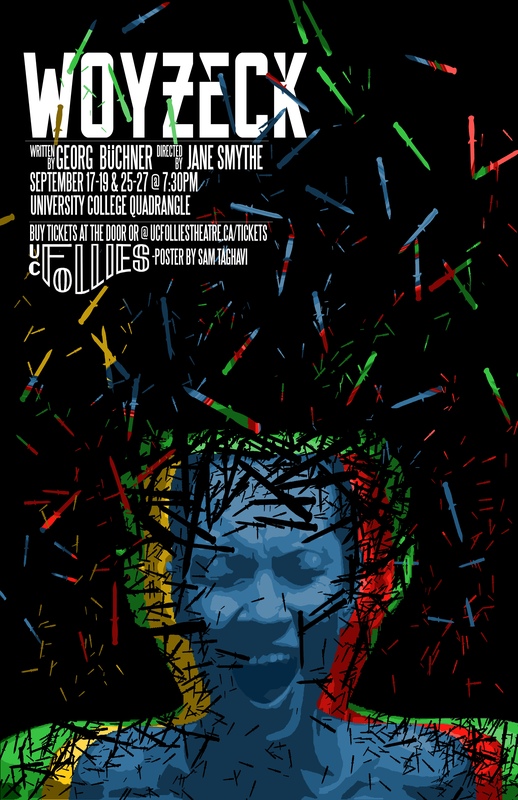 To kick off the their season of exploring identity performance, the UC Follies presents Woyzeck, by German playwright Georg Büchner, translated by Victor Price. Woyzeck is the influential story of a distraught soldier oppressed by his class and social conditions. Written in 1836 but performed in 1913, Woyzeck offers layering commentaries on the fragile human psyche and the inadequacy of clinical trials. In order to make money to support his wife, Marie, Woyzeck performs jobs for his Captain as well as taking part in a torturous medical experiment for the Doctor. As part of the experiment, Woyzeck is forced to eat nothing but peas. We witness his escalation to a desperate attempt to hold onto his mind. “Produced by the UC Follies in the historical outdoor venue of the University College Quadrangle, Woyzeck is set during ‘outdoor time’ at a 1960s mental health institution, a time when such health care was on the breach of modernity. It will be presented by a 5 part, all female ensemble putting on a play for their visiting loved ones. Using movement and different mediums of art, Georg Büchner’s play raises relevant concerns of the harsh and cyclical reality of mental illness and its effect on arts workers. The emphasis of such central themes seek to lift the stigma that surrounds mental health in a modern age.” Jane Smythe, Director. Tickets: $10 students | $15 adults | Group bookings also available! a. Oversee all operations of the company and ensure it is fulfilling its mandates. i. Keep accurate financial records and ensuring that the UC Follies is staying within their budget. TO APPLY: Please send in a resume and a cover letter to ucfollies.producer@gmail.com outlining why you are interested in the position and why you feel you are qualified for the position. Please include the title of the position(s) for which you are applying in the subject line – you may apply for more than one. Please note that the UC Follies Theatre Company strives to provide an environment in which individuals can foster their skills in these positions, therefore you do not need specific experience with these positions to apply for them – rather we are looking for individuals to make connections with leadership positions they have held in the past so they can bring these skills to our team. *If you would like to apply for more than one position, you may send in one artistic resume, but one cover letter per position is required. *These positions could be merged into Artistic Producer if the Selection Committee thought it was best to take this route. -Responsible for maintenance of website, Facebook, Twitter and other representations of the company in the media. Description: The Drama Coalition invites the entire University of Toronto Theatre Community for a night of celebrating all of the incredible work that has occurred throughout the 2013-2014 season. If you have worked on any U of T show in any capacity for the 2013 – 2014 season, you are invited to attend! The Coalition Exec and a group of College/Campus Theatre representatives have attended all of the participating societies’ shows and will be highlighting the “best of the best” in this awards show/party. The ceremony will take place in a room at Hart House that is to be determined. Nominations will be released on Sunday March 30th, 2014 in the late evening. This is a semi-formal event so although we invite you to dress in whatever makes you feel comfortable, please keep in mind the spirit of the event. Meet the Drama Coalition of 2014! Meet the Drama Coalition Exec and Reps of 2014! You are cordially invited to the Second Annual Drama Coalition Awards! achievements of our Dramatic Community! … The night will include will include awards from the year, the Drama Festival award winners and the Hart House Players Playwriting Contest Winners. We will also have free food and a cash bar! If you were involved with ANY of the shows this year we encourage you to come out and support your peers/nominees from your drama society or group!! So come on out and celebrate the last day of classes with a night honouring the entertainment of the past year! SMAC is looking for actors IMMEDIATELY for both of their one-act plays for the drama festival!!!! If interested, please e-mail arts@smcsu.com ASAP!!!!!!!!!!!!!!!!!!! Seize this opportunity and help secure SMAC’s well-deserved place in the Drama Festival!!! It’s that time of year again! The U of T Drama Festival is an exciting showcase of student theatrical talent! Come on out for our 4 night festival, which features student written one-act plays from the 7 U of T Dramatic Societies!!! This year the festival will be adjudicated by Derek Boyes, an Associate Artist of the Soulpepper Theatre Company. Watch as these outstanding students give it their all and compete for awards such as Best Production and Best Original Script! The festival will end with the presentation of awards on the 16th. Come on out for 4 nights of entertainment and support U of T’s aspiring artists!